On booking, a non-refundable deposit of £100 is payable. Remainder is due 8 weeks before start date plus £100 damage deposit (refundable after stay assuming all in order). Payable by bank transfer. Keys will be made available on production of the Key Release Form from 4pm on day of arrival. Caravan to be vacated by 10am on day of departure. Please contact me for accurate 2019 prices and availability or any questions that might not be covered below. We will consider shorter lets than 7 nights but our high cleaning costs may not make these competitive, but always worth asking. Our caravan, named Tullochville, is in a beautiful spot on Kelling Heath Holiday Park. It is south-facing so has the sun all day and in its own secure garden, there is a huge oak tree to offer shade if needed. 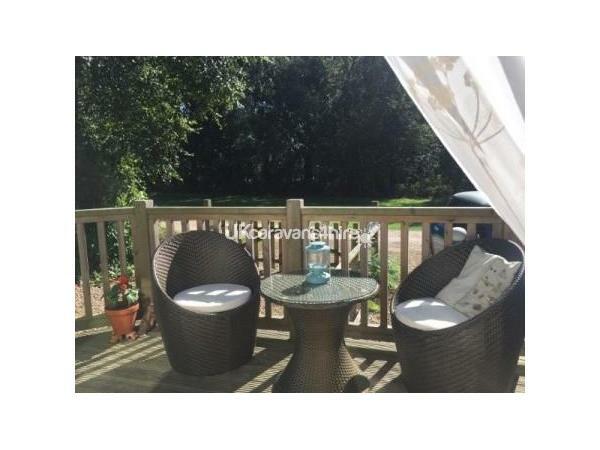 Tullochville has a large decking with rattan furniture, perfect to sit out and eat breakfast or enjoy a glass of wine whilst looking directly onto the Hundred Acre Wood with its abundance of wildlife. There is also an outside table and chairs, and a swing seat. Entrance is straight into the porch room which is ideal for a dog bed and to take off muddy boots and hang up coats before entering into the main caravan. The washing machine/dryer and dishwasher are in the porch and there is a large worktop. Binoculars and rechargeable torches are here for you to use as the Park has no street lighting so although dark to walk around, has wonderful night time skies. 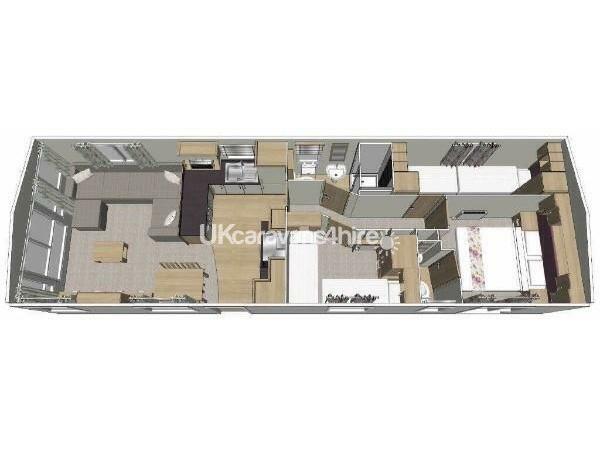 The caravan itself has three bedrooms, one double and two twins (no bunks). The double bedroom has an en suite cloakroom, and a wall mounted TV and DVD player and an electric blanket on the bed. One of the twin bedrooms has enough floor space to fit a travel cot (available if needed) and both have ample storage. We also have a baby seat and a high chair. There is a family shower room with very roomy shower cubicle and heated towel rail. 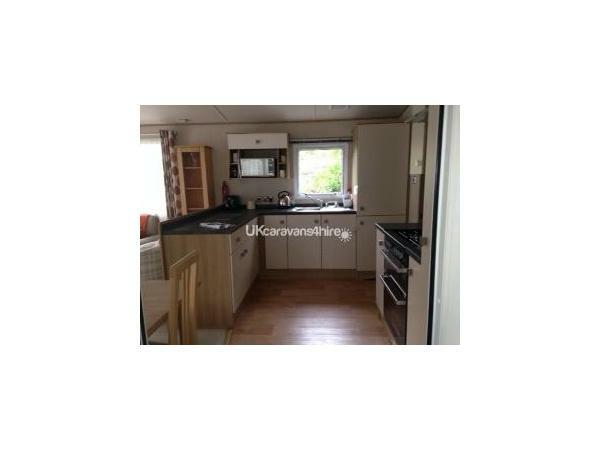 The kitchen area is equipped with large fridge freezer, gas cooker and hob, microwave, toaster and slow cooker. The comfortable lounge has a sofa and chair and free standing dining table and chairs. There is a TV with Freeview and built in DVD with lots of dvds plus a computer quiz machine which is great family fun for a rainy day. The lounge has patio doors which open out onto the decking. 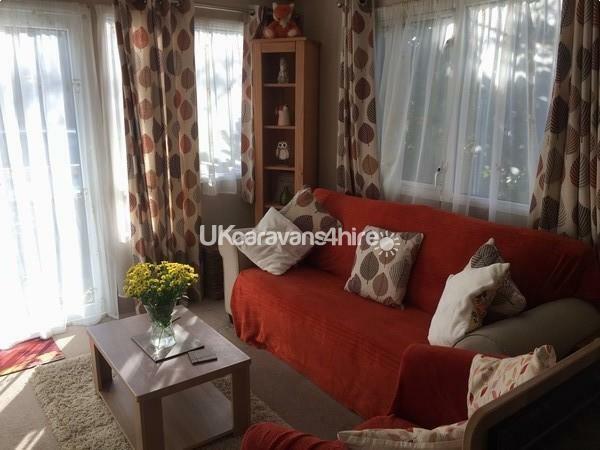 The caravan is fully double glazed with central heating and a gas fire in the lounge. In the garden there is an outside tap and hose to wash off muddy paws. 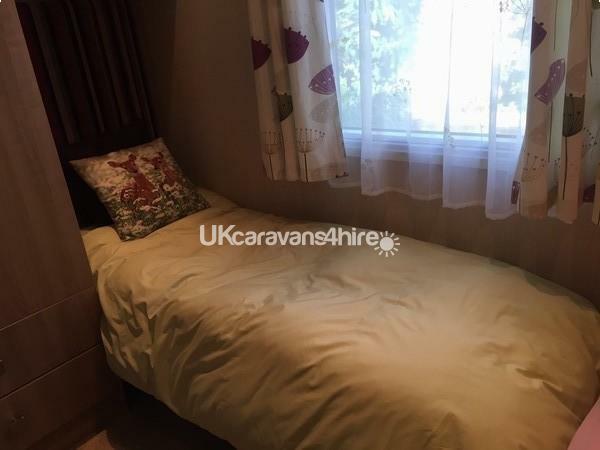 There are too many extras to list in here but please be assured this caravan is extremely well equipped inside and out to have a very comfortable stay. 2 for 1 leisure club passes are included with each hire. One well behaved dog welcome at owners discretion. Quality bed linen is provided along with tea towels, but please bring your own caravan and pool towels. This caravan is professionally cleaned in between each hire. Please contact me for a price if you have dates in mind. Additional Info: Sauna, jacuzzi, steam room. Guided walks, pub, restaurant, pizza shop in summer, well stocked general shop and newsagents. Cycle hire shop. This beautiful caravan is even better in real life than the pictures, they don't do it justice! On driving up we were blown away by the outside space, the views and the location. My Dad had booked for myself, sister, 2 sons and daughter and found communication and booking easy and straightforward and the owner friendly and lovely to deal with. The porch attached to the caravan is a brilliant addition. Inside the place is homely, comfortable and incredibly well equipped. We especially liked the little room where the beds run along it, rather than being next to each other , which gives the illusion of more space and privacy for the occupants. So many lovely little touches throughout that all added together to make the stay a lovely experience. Unfortunately on only our second day, my elder son had an incident and managed to break a window (over excited and trying to skim fir cones across the roof of the caravan - he is 15 and should have known better and was mortified) obviously I let Sue know immediately and she called me and was probably a lot calmer than I would have been in that situation, we felt awful that we had damaged her beautiful caravan . She dealt with it in a calm and efficient manner - obviously with me taking full responsibility and paying in full for a replacement window, but it could have completely ruined our holiday if she had reacted in a less professional and calm way! The caravan is close enough to all the amenities to get to easily but far enough away to be peaceful and in a beautiful part of the forest. Thank you, Sue for a lovely holiday. We booked the caravan last minute and Sue was very quick to respond and happy to accommodate our last minute booking, she was so friendly and helpful. Upon arriving at the caravan we were so pleasantly surprised, every aspect of it was perfect, it was clean, nicely decorated, the kitchen very well stocked and even a washing machine and dishwasher. The shed was full of outdoor fun things to do including his and hers bikes with kiddies seats. The plot is great and private, looking on to a grassy patch with forest behind it, not overlooked at all and an easy walk to the site centre. Despite having 2 young children (2 & 4) we managed to sit and enjoy morning coffee and evening drinks on the balcony. We have stayed at KH a few times previously and this is by far the best accommodation we’ve had, we’ll definitely be looking to book the same caravan again. It was just perfect, we don’t have a dog but if we did, the porch area would have been more than adequate for it’s sleeping area and the plot is totally secure. I think I’d have to say my favourite things though about this caravan were the little touches, hand towels, nice shower gel, bedroom TV, scatter cushions....all these things made it more than just a base for our holiday, it was somewhere lovely to come back to after long walks and an active day out. Thank you so much Sue, we had a wonderful time. Lovely caravan with everything you would need. It is in a lovely spot very quiet. Sue was very quick to reply and was happy to answer any questions. Hello Bev Thank you for taking the time to review Tullochville, and we are very pleased all was satisfactory for you, and that you had a wonderful time. Look forward to having you back! 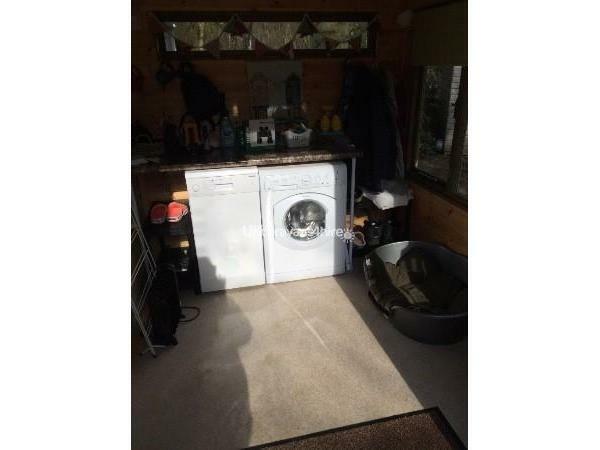 Lovely caravan in very quiet location ideal for the dog as completely secure .Very well equipped and having washing machine such a bonus as laundrette on site is expensive .All enquires dealt with very promptly and efficiently.Would definitely recommend !! We've stayed in several caravans over the years with our 2 children, and this ranks up amongst the very best of them. This was the first time we took our dog away with us (which we have only had for a year), so it was something of a test, but if they're all as good as this she'll come with us every year! The porch is great for dogs, ours slept in there in her own bed overnight without fuss. 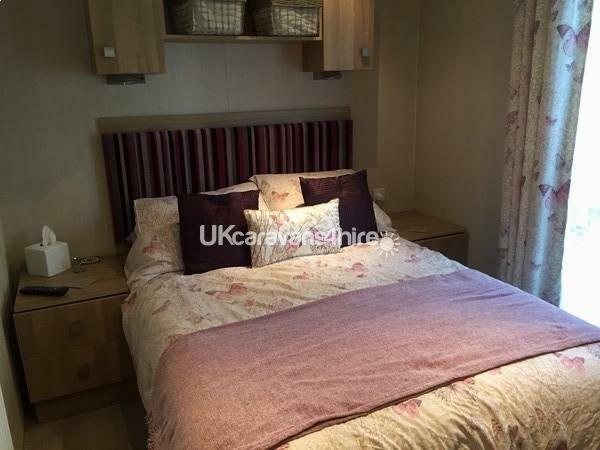 The caravan itself is comfortable and equipped with everything you could possibly need, and is situated in a great part of the park away from the bustle of the centre (but near enough to be there on foot in 5 minutes). It has lots of little touches as mentioned in the advert, we particularly enjoyed the outdoor furniture for evening dining and relaxing. It's situated on a sizeable plot with its own gate, so safe for dogs and children. It's also very private, you don't realise you're on a park with anyone else as it's surrounded by trees and faces a large grassed area (perfect for the kids & dog!). The area itself is great for families with lots of attractions and beaches - we particularly enjoyed Holkham, and there are discounted family tickets for the North Norfolk Railway (with the park also having it's own platform). Everywhere is also very dog friendly, the railway/beaches/pubs were all very welcoming of our dog. We were genuinely disappointed to be leaving, so we will be sure to return the next time we holiday in Norfolk. Sue was also a pleasure to deal with, always prompt to answer any emails or calls. All in all, a perfect holiday! Had a great break in a lovely caravan everything you need for good restful break provided for us including our small dog.very nice fenced in garden so very safe for him.sue the owner a delight to deal with,and super fast to answer any questions.we hope to return soon. Let's start by simply saying "We will be back!" From initially booking our holiday to returning home, the owner was extremely helpful. 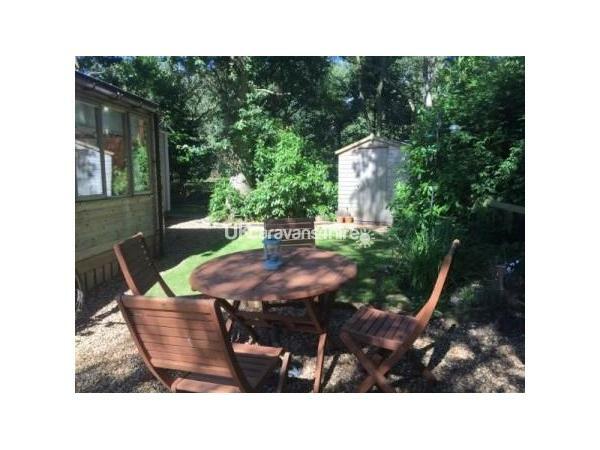 Communication was excellent.The caravan is situated in the amazing Kelling Heath holiday park on a private sunny spot with a dog friendly, fenced private garden. The decked area overlooks a firebreak area in the forest offering privacy whilst watching the abundance of birds with a cup of coffee. On entering the caravan you first go into the additional porch area (a real benefit for dog owners and parents of children) This is a warm, clean area perfect for taking off muddy wellies and wet coats and drying off wet paws. The addition of a washing machine and dishwasher was a rare treat in a caravan! 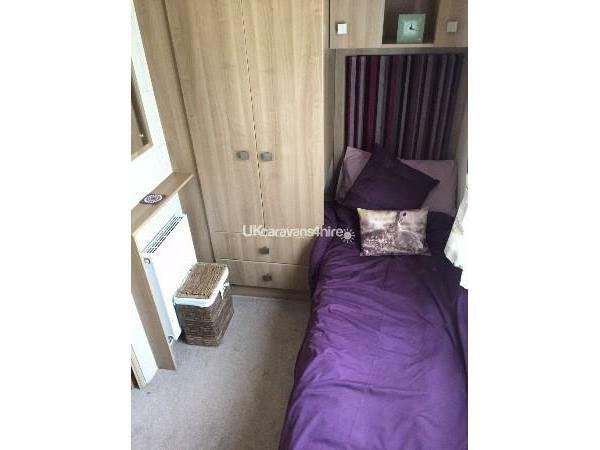 The caravan itself can only be described as a home from home, it looks brand new! It's modern, homely and comfortable. The owners have thought of everything you could possibly need. The bedrooms are gorgeously decorated with the addition of extra fluffy blankets and cushions. 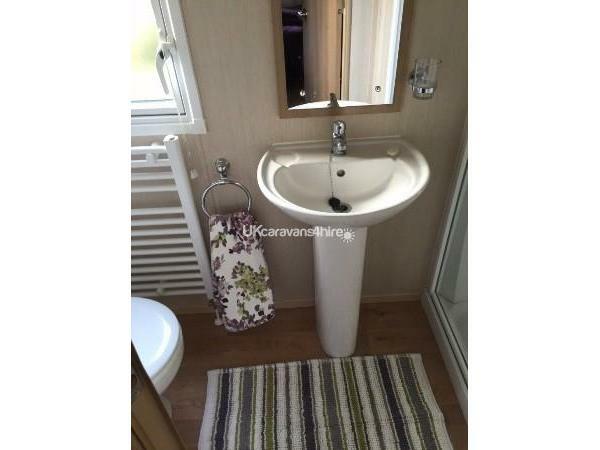 The caravan is immaculate throughout and of a very high standard. The owners information pack is extremely useful and additional leaflets can be collected from the main reception at Kelling Heath. We would highly recommend visits to Holkham sand dunes, a seal watching trip to Blakeney Point and a ride on the North Norfolk Steam railway straight from the site. (All of which you can take your dog with you!) 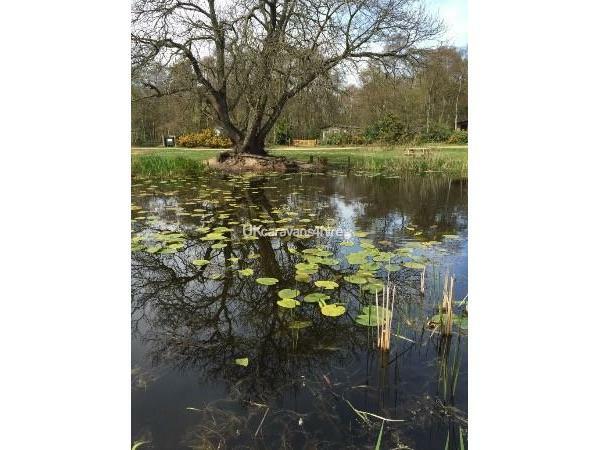 Cycling and walks around Kelling Heath itself is a real adventure taking in views of the conservation pond and fishing pond, railway halt, rare sheep breeds and red squirrel breeding programme. We still have so much more to see and do in Norfolk....we will be returning!